What is the number one thing that can ruin any backyard party? Getting attacked by mosquitoes. These flying pests can be literally a pain once they start feasting. And getting rid of them often seems impossible.Mosquitoes are persistent little pests, once they find a thriving place it will become their haven. So, how do you get rid of them? Read on, because I have a few suggestions and tricks on how to make your yard a mosquito-free zone. How Do You Know If You Have Mosquitoes Around the Yard? It’s highly likely that the first sign to alert you to your pest problem will be itching. Mosquitoes can appear from nowhere and leave you with a red, itchy bite. Or, more often, several at a time. 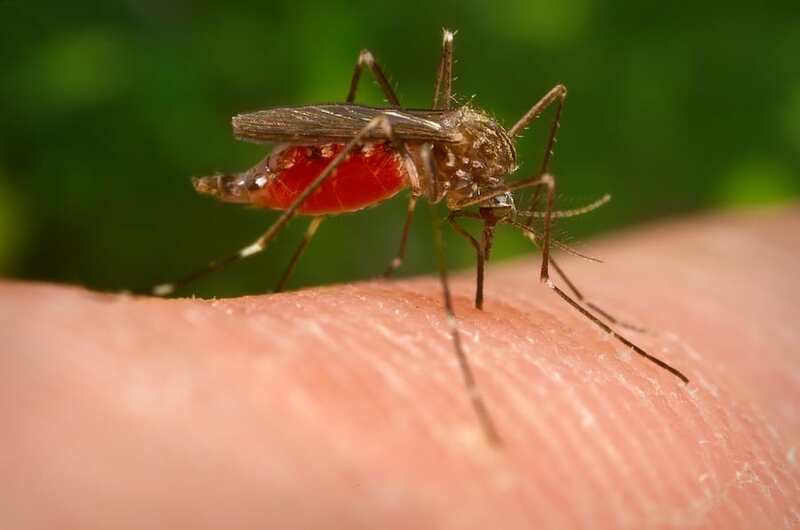 Did you know that it is only actually female mosquitoes that bite and feed off humans? The male likes to feed off sweeter sources, like nectar. Another thing to look—or listen—out for is the sound mosquitoes make. The loud, buzzing noise will become even more noticeable if you have an infestation living in the yard. Still water sources, such as bird baths, pools, and full buckets, create idyllic places for mosquitoes to thrive. If you have any standing water, you can be certain there are mosquitoes to be found. The lifespan of a mosquito consists of four stages: egg, larva, pupa and adult. Knowing how to detect the larvae and the eggs might help to get rid of the pests before they reach adulthood. Mosquito eggs are often laid by the female on or near water. They can also be found anywhere that is damp or moist, like soil. When laid on water, the eggs will form a raft, often consisting of over a hundred eggs. These can be seen floating on water sources. The larvae can also be found in or around water. Larvae are resilient and can live in water for more than 14 days, depending on the temperature. Mosquitoes are found all over the world and are mostly known for being annoying pests. However, they are also famous for being transmitters of dangerous diseases. Malaria, dengue fever, and the Zika virus are only a few of the viruses mosquitoes can carry. The common mosquitoes in North America aren't generally dangerous, only very obnoxious because of their bites. In humid areas, however, disease-carrying mosquitoes are often found. These include places like South East Asia and some southern US states, like Florida. If you happen to live in a virus-prone area, think about taking certain measures to get rid of the mosquitoes. And to minimize the risk of infection. Most people don't realize that it is possible to get rid of the mosquitoes in their yards for good. We have all heard of mosquito-repelling candles, sprays, roll-ons, turning off any light sources which we know mosquitoes are attracted to, etc. Chances are, we’ve tried most of them too. The problem is that these aren't long-term solutions. The first step to take is to reduce any water sources. Even better, eliminate them if possible. Things like kids' pools, buckets, and water bowls should be turned over when they’re not in use. These items will fill up whenever it's raining, and that will create the perfect place for mosquitoes to lay their eggs. Setting up a bug-zapping device can also help to minimize mosquitoes and other flying insects. These devices attract the bugs and instantly kill them when they make contact. A downside to these is the constant zapping noise. They’re also not particularly attractive. Mosquitoes are not fans of the wind. This is why bites are rarer on windy days. Take advantage of this fact and set up one, or several, fans on the terrace or in the yard. Though this may be a good option for a quick fix, it won’t keep the pests away for good. Attracting natural mosquito predators is an excellent way of reducing the population living in your yard. The Purple Martin bird is a well-known mosquito lover. You can easily attract it by setting up feeding stations offering its favorite foods. The Purple Martin is mostly found on the East Coast where the temperature is ideal for this bird. But it's not uncommon to see them on the West Coast as well. There is a wide range of treatment options available. Some of these kill the mosquitoes, some repel, others kill eggs and larvae, and there are those that do it all. You have to think about your situation first. Using strong chemicals may not be an option. Some people prefer to let professionals do the job, but with the right knowledge and tools, you can do it yourself with no problems. Some water sources, like fish ponds or ditches, can't be drained. Don't worry, though, other measures can be taken to get rid of the mosquitoes and their offspring. Mosquito dunks are an easy way to kill off any eggs or larvae, without harming other animals or the environment. The dunks release toxins that will keep eggs and larvae away for up to 30 days. Some work for up to two months. You can buy them at any home center, to add to your water features or pool. The dunks come in brick form or donut shapes. These are also safe for use in fish ponds. Another option to treat water is by using a bacterial treatment. There is a specific bacteria called bacillus thuringiensis israelensis, or BTI for short. It kills mosquitoes and black fly larvae but is not harmful to fish, animals or plants. Pyrethroid sprays are a form of broadcast treatment. These can be used in bushes, trees, and other large areas where the mosquitoes might be hiding during the day. You can simply use a garden sprayer for the quick treatment of all shady areas around the yard. Spraying any entries to the house is important too. Whenever we open or close the door, we invite the unwanted pests in. Hose sprays are an excellent way of quickly applying treatment to larger areas. Other sprays, like cyfluthrin, are safe to use on wood and underneath houses. The spray can also be applied on brick walls. However, walls may have to be treated a few times to reduce the number of mosquitoes living there. We've also reviewed a selection of our favorite mosquito yard sprays here, too. Foggers, tools used to create a fog out of chemicals, are also an option. These are most often used in areas with a high population of mosquitoes. The best fogger approach is to use it to line the yard. By that, I mean you create a barrier between the mosquitoes and your garden. The treatment will help to keep mosquitoes away from your bug-free zone. There are also an array of plants that have been known to repel mosquitoes, so it's worth looking to see if any of these could be planted in strategic locations around the yard, too. Eliminating places that can hold water is crucial. Old, stagnant water is the ultimate breeding ground for mosquitoes. After you’ve done that, getting rid of the source, namely the eggs and larvae, is the best place to start. Only getting rid of the adult mosquitoes won't be enough, and you may quickly find new, young ones ready to thrive—and bite. Piles of leaves, plant waste, etc. in your garden help create a moist, humid environment for mosquitoes. There might be water in old tires, pots, and plant saucers lying around. Regularly turning them over will remove any eggs and larvae that might be lurking. Of course, some items, such as ponds, are not able to be turned over. In this case, it’s a good idea to drain the old water and replace it with fresh water, if possible. Fresh, clean water is not as attractive to mosquitoes as stagnant water. If you have a pool or a fish pond, draining it regularly won't be a sustainable option. In this case, I recommend purchasing an egg and larvae treatment. First of all, make sure that it’s safe for humans and animals. The safe formula will get rid of any eggs or larvae that may be living in your pool. Plus these treatments will make it impossible for new eggs and larvae to survive. Clearing the gutters often so that water can flow with ease is another good preventative measure. The last thing you want is leaves clogging up, leaving a pool of water that turns into a mosquito paradise. Another popular item in many of our yards is a tarp. Lots of us use them to cover outdoor items such as grills, furniture, or firewood. If you have one of these, make sure to wrap the tarp tightly. Otherwise, rainwater will pool inside low and loose spots, creating a breeding ground for mosquitoes. Standing water makes for a thriving environment for mosquito eggs and larvae, but where do the adults like to hang out? Trees, bushes, and tall grass all make the perfect hiding place for mosquitoes during the day. Therefore, it's crucial to trim and prune all your plants often. Regularly mowing your lawn will help too. A beautifully cut lawn not only looks good, but it also prevents the mosquitoes from hiding in the long grass. I highly recommend making a plan, detailing how and when to clean up the yard. The best way to keep mosquitoes at bay is by preventing them from being there in the first place. Keeping the lawn, trees, and bushes trimmed and tidy will eliminate the hiding spots these pests love. Getting rid of, or reducing, standing water sources can also help to eliminate eggs and larvae. I suggest covering any non-moving water sources, like pools and water tubs, when they’re not in use. If items can be emptied and turned upside down to stop water pooling, do this regularly. It will prevent more eggs from being laid, hatching, and eventually, biting.